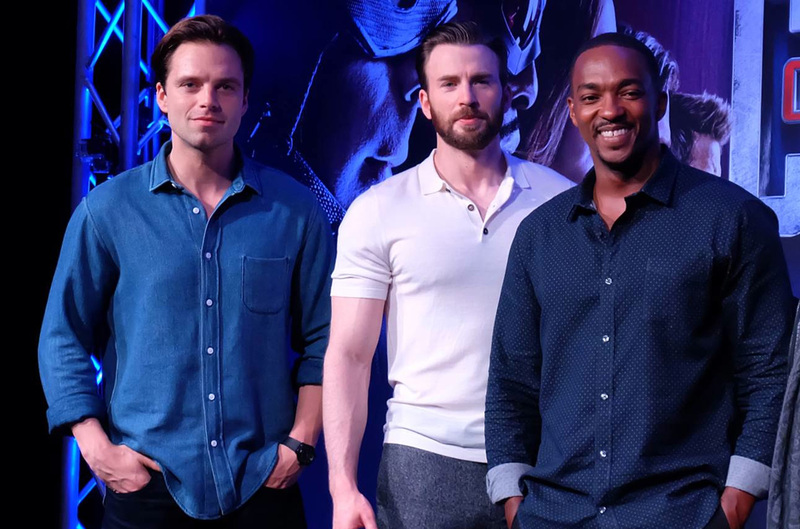 During the panel at Wizard World Con in Philadelphia this weekend, Chris Evans, Sebastian Stan and Anthony Mackie answered some really intriguing questions, most of them pretty candidly. One such question from an audience member inquired what each actor’s dream role is. After a bit of prompting, Evans, a consummate Disney fan, piped up that he’d be interested in taking the part of Prince Eric in The Little Mermaid. Immediately he regretted answering as such, claiming the story would then be all over the Internet that he’s campaigning for the role. Clearly the audience thought it was a brilliant idea. We agree with Evans, however, that Mackie would make an awesome Sebastian the crab given his constant, hilarious and off-handed remarks. Evans is also a big fan of musicals, his favorite being West Side Story. He remarked that he’d love to be in a remake of the film, inspiring Mackie to tease him about being the “whitest Jet.” We’ll just put aside the fact that Evans is turning 35 next week. If he wants to play a teenage gang leader, let him. It’s not like Russ Tamblyn looked 17 either. And lest you worry if Evans has the singing and dancing chops, he’s been known to carry a tune pretty well and has been tap dancing since he was a child. You can see a sampling of it at the end of Playing It Cool (also with Mackie), which is probably one of the very, very few reasons to watch it at all. Stan went in a different direction by fulfilling fans’ desires, saying he’d love to do a 48 Hrs. remake with Mackie, which would likely be the most awesome comedy ever. Their banter on screen and off has become the stuff of legends. And speaking of Sebastian Stan… When a fan asked what MCU film he would like the Winter Soldier to appear in besides the Captain America and Avengers films, he immediately went in for the kill: Black Panther. As he pointed out, it makes perfect sense given where Captain America: Civil War left off. The fan presented another option in the long-awaited-but-not-confirmed Black Widow solo film, which really would make a lot of sense given the characters’ Soviet backgrounds. The possibility of at least a cameo from Bucky Barnes in Black Panther has been talked about before. We’ll know for sure when Black Panther heads into theaters July 6, 2018.